Fantasy football started small, but it's so big now that even the NFL has gotten in on it—and they're charging a few bucks for the privilege of helping you master your draft. Luckily, there are apps for android and iPhone users to get on their phones that could help hem master the game without spending money. But how to find the right app for that purpose? Will it help to improve your game? We looked and we discovered one amazing sports app for these purposes - Sit or Start Fantasy Football. 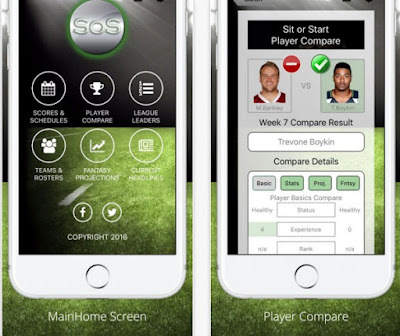 Easy to use app, a great choice for every fantasy football player that needs to get his game on a high level. This app is developed on android and IOS platform, allowing users to make the best fantasy football decisions and create smart football tactics for their team. With using this app, the users can get complete and detailed information they need, statistics and analysis, that will give them the power to create undefeatable team and win the league. This fantasy football app gives the users many useful features that will help them improve their game performance. Analysis and statistics with details as player and team stat and fantasy projections, side by side player comparisons, scores and schedules, season and weekly stat breakdowns, expert rankings, player and team analytics and charting. Having the complete information and stats the players can create the best team ever. Soon, the game will offer updates and upgrades to create a fantasy football app that will offer everything a fantasy football player needs. Fromteam game stats, alert notifications with news and status of players,IDP rankings, to integration with external services, and much more. Download it now on Google Play or App Store for FREE!